Magnificent home with three bedroom suites and large deck fronting on False Bay. Very close to Boulders beach and the penguin colony. Unique German architecture and elegant Cape Colonial furnishings. Overlooks breaking surf and marine sanctuary. Views of passing whales and porpoises from garden and deck. Steps down to the water for snorkeling and swimming. Easy access to Cape Point and hiking trails. Oatlands Place is a spacious, three-level coastal retreat with an idyllic scenic setting on the Indian Ocean. Sleeping six, this recently remodeled home overlooks distinctive rock formations on the way to the Cape Point marine sanctuary near Boulders and Murdock Valley, just outside the naval base and retirement community of Simon's Town. Spacious outdoor deck, patio areas and quality furnishings make this a memorable retreat for short-term getaways with family and friends. 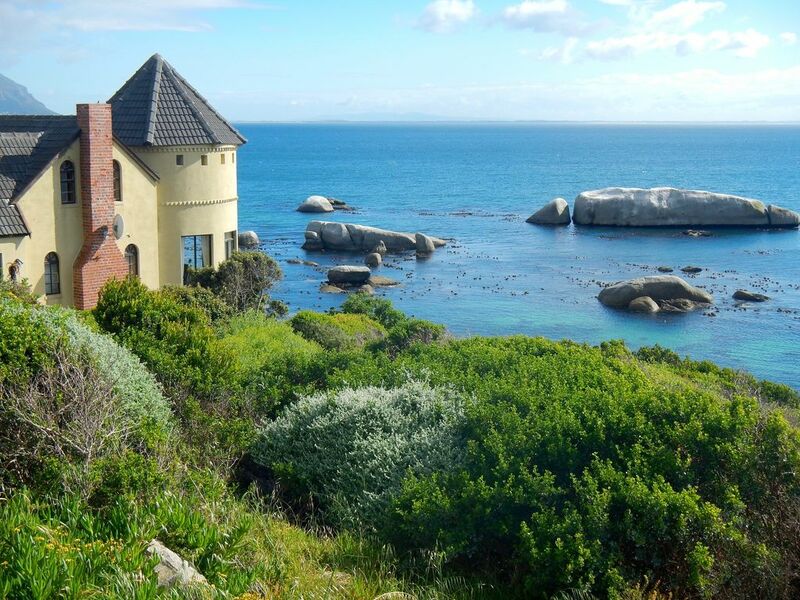 An observation turret, artist's loft and three well-appointed en-suite rooms enjoy sweeping panoramic views of False Bay with its migratory whales, seals, penguins and diverse bird life. Nearby diving, kayaking, surfing, golfing, squash, mountain biking, fishing, and hiking make this an ideal location for the outdoor active. Enjoy a secure luxury vacation residence equipped with satellite TV, broadband Internet, and rapid response security systems. Award-winning interior design with unmatched panoramic views from Miller's Point to Boulders and across False Bay; pristine marine sanctuary setting just steps to the ocean, rocks, swimming or snorkeling with grassy areas and a spacious ocean-facing deck for entertaining, relaxing and birdwatching. Main level lounge area with working fireplace, high quality Cape Colonial leather chairs, couch and tasteful African décor. Large diningroom area off lounge has ocean view and seating for eight guests. Adjacent turret with 180-degree ocean view and table and seating for four. TV entertainment center, stereo system and high speed wireless Internet access throughout the house. Fully equipped and accessorized kitchen, large electric stove, convection oven, microwave, dishwasher, and washer/dryer in laundry area. Downstairs master bedroom (queen) in turret with sweeping views of False Bay and deluxe tub with relaxing jets. Downstairs guest bedroom with two single beds and adjoining shower and toilet overlooking the ocean. Main level bedroom (queen) with large river stone shower area and window-facing bath tub with a scenic ocean vista. Two sets of linens for all beds along with house and beach towels are provided. Short walk to Boulders National Recreation Area, sandy beaches, safe bathing and launch area for kayaks and diving. Easy drive to Cape Point and Peninsula destinations like Noordhoek, Kommetjie, Kalk Bay, Muizenberg and Scarborough. One hour’s drive to Stellenbosch and the wine region of the Western Cape. Minutes away from 7 Eleven, Spar, excellent restaurants, hotels, cafes,mall and shops in nearby Simon's Town, Glen Cairn, Fish Hoek and Sun Valley. Nearby country club has nine-hole golf course, squash courts and restaurant. Fitness clubs in Fish Hoek and Westgate. Off-pavement parking for unlimited number of cars. No permits. Well-patrolled and well-lit road. Scarborough security alarm system with rapid response patrol cars minutes away. Safe, secure environment with South Africa's naval base and a local police station nearby. On-site tenant occupying adjoining flatlet to help with check-in, departure and local travel advice. This individual specializes in guided tours, customized excursions, hikes and kayaking expeditions to Boulders. Floor heating in downstairs area. Been to 70 countries and simonstown one of favorite places yet. House is great! Family of 4 had plenty of room, in fact we could have stayed in the downstairs alone. Walk to beach 5 mins for swimming and boogie boarding and we even swam all the way to the big rock island out front of house and climb up the rope, met the resident seal, and then jumped off and swam back. Altogether awesome experience but the best part may be the property Dan who is tremendous host...wish he was an app that would magically appear at all out vrbo houses ! We loved our stay at the Oatlands Place. Before I talk about the property itself, I want to give a shout out to Dan (the property manager). He was absolutely wonderful and went above and beyond to help us out during our trip. If we had to rate the property manager, he would easily get 5/5 stars. Moving on to the property, it was just gorgeous. It had a rustic feel to it, but was very well maintained and updated. The views were breathtaking, and we loved waking up and reading on the porch. Another thing we loved was the placement of the bathtubs. They are next placed next to some large sliding glass doors, so you can take a nice bath and just stare out onto the bay, with the sea breeze blowing in if you want. Finally, it was a perfect staging point to explore the rest of the peninsula. We did all the scenic drives, explored the quirky towns nearby (Kalkbay, Noordhoek, Hout Bay, Fish Hoek, Simons Town, etc), and ate at many delicious restaurants. We highly recommend this place for anyone who would like to experience Cape Town, especially if they're interested in the southern peninsula! Das Haus liegt direkt an der False-Bay, alle Zimmer bieten Blick aufs Meer. Dan war ein sehr netter Verwalter. Im Haus ist alles notwendige vorhanden. Sehr gute Restaurants sind unweit zu erreichen. Zum Cap Point ist es nur ein kurzer Weg und über die Panoramastraße M6 geht es zum Tafelberg. Zu empfehlen ist auch das Frühstück im Lighthouse Cafe .